Seung Jae (Ryan) Lee is a rising Junior from Seoul, Korea, attending St. Mark's School. Ryan is interested in mathematics, physics, and computer science. He studied multivariable calculus and differential equations with video lectures and problem sets, and is currently studying linear algebra. He uses his spare time to add new posts to his website (mathalgorithm.com). One of his lifetime goals is to fully understand the proof of Fermat's last theorem, and he is currently preparing himself with the basics before he steps into the field of elliptic curves. 1. Look at the naturally chaotic behavior of a double inverted pendulum. 2. 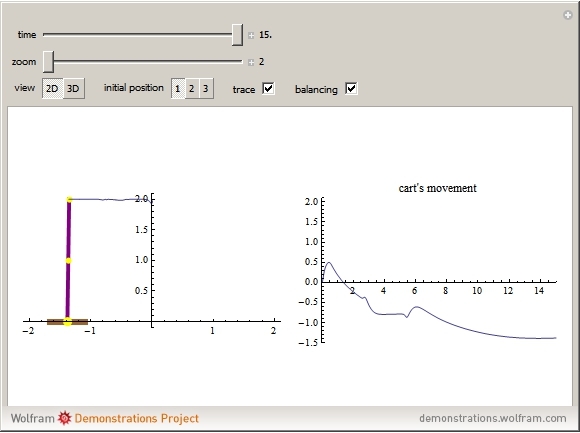 See how the control force balances the cart.